Aaron Scott won the Folksworth 15. Top local roadrunner Aaron Scott was a convincing winner of the big Folksworth 15 race at the weekend. 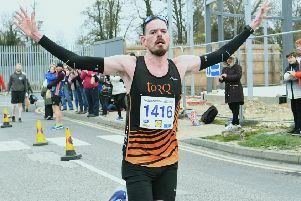 The Stamford-based Notts AC man, who runs second claim for Nene Valley Harriers, scorched home well clear of the 440-strong field in a time of 1:19:13. Runner-up Steve Robinson, from Peterborough AC, clocked 1:22.26 with third place going to Daniel Middleton of Norwich Road Runners in 1:23:48 and fourth to Anthony Johnson of Werrington Joggers in 1:27:35. Paul Lunn of Nene Valley Harriers took the Over 40 prize with a sixth-place finish in 1:29:45 just ahead of Ramsey Road Runners’ Simon Mead, who was eighth in 1:30:20. Sean Beard was another Nene Valley Harrier to run well. He was 15th in 1:31:48 and claimed second place in the Over 45 category. First female home was Tracy McCartney from Nene Valley Harriers. She was 26th in 1:37:38. Nene Valley Harriers picked up two medals at the Northern Indoor Championships in Sheffield at the weekend. Sprinter Kane Wright took the silver in the Under 20 men’s 60m after clocking 6.96 in the final. In his heat, where he also finished second, he achieved a new personal best (PB) of 6.95. The other medal - a bronze - was won by Rosie Fresen in the Under 17 women’s pole vault. She set a new PB of 2.70m. Ashley Sandell, last year’s England Under 17 indoor 400m champion, did well in his heat of the Under 20 men’s 400m, winning it in 50.72, but had to withdraw from the final through injury. Under 17 Women’s 60m: Megan Pusey 7th heat 8.65. Under 17 Women’s 300m: Megan Pusey 5th heat 45.98. Under 20 Women’s 800m: Rosie Marshall 4th heat 2.35.19. Under 20 Men’s 800m: Max Butler 4th heat 2.02.42. At the Southern Indoor Championships at Lee Valley, Ben Jones of Nene Valley Harriers reached the semi-finals of the senior men’s 400m. He was third in his heat in 51.94 but fifth place in the semi-final in 52.20 wasn’t quite good enough for a lane in the final. Lloyd Kempson just missed out on a place in the senior men’s 800m final after finishing third in his heat in 2.01.84. Clubmate Oliver Dilloway was eliminated in the first round of the Under 20 men’s 200m after finishing fourth in his heat in 23.90 and in the senior men’s 400m Russell Dowers of Peterborough Athletic Club also bowed out in the first round. He clocked 56.78 for sixth place.